Abdelrahman Obeidallah, or Abed, as most called him, was shot dead by Israeli forces in Bethlehem on Monday just minutes after his school was let out. He was 13 years old.Abed was wearing his school uniform, a light blue collared shirt and black khaki pants, holding his backpack with a group other students when Israeli forces shot him in his chest, killing him almost instantly. While the Israeli army has yet to release an official statement to Ma’an, Israeli media has reported that officials have said forces were aiming for Abed’s legs, but the bullet hit the ground and ricocheted into his chest. Days before his death Abed and his father, along with dozens of other boys from Aida refugee camp where he lived, were undertaking a clean-up project for the camp’s community soccer field. Fadir Obeidallah, Abed’s uncle, told Ma’an that Abed and his friends were gathering in preparation for a soccer game at that field when he was killed. During his nephew’s funeral, Fadir carried around a poster with a picture of Abed taken right before he was killed; a red circle is drawn around Abed with the time it was taken, with the time of his death displayed at the top. The poster was handed out to mourners across the funeral. Abed was killed right outside of Aida camp, home to nearly 5,000 Palestinian refugees whose families were displaced from their homes between 1948 and 1967. Because of the recent upheaval in the occupied West Bank and East Jerusalem, and Aida camp’s politically charged environment, clashes there have been a daily occurrence. But his uncle said that when Abed was killed the clashes were light, having just started, with only a few boys throwing rocks at the Israeli separation wall that hems in the camp. 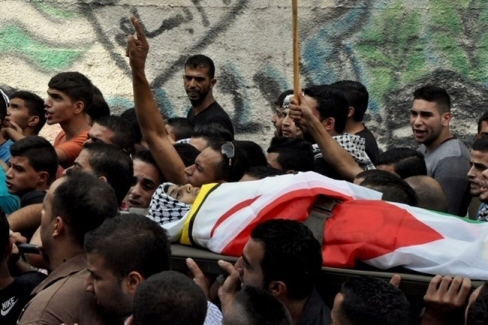 As required by Islamic rites, Abed’s funeral took place as soon as possible. The day after he was killed, the funeral procession began at Beit Jala Hospital where doctors were unable to save his life. More than a thousand mourners carried the body of the ‘shaheed,’ meaning martyr, through the streets of the city to the family’s local mosque. The marchers screamed for revenge, chanting slogans that likened Israeli soldiers to terrorists. 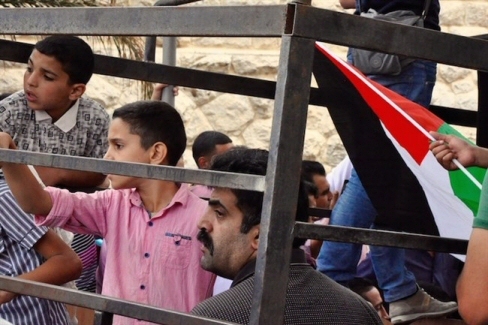 Stores had closed in mourning of the 13-year-old’s death, while mothers, the elderly, and small children stood along the streets, watching as the march made its way through Bethlehem. As the procession reached the mosque, the crowd stopped chanting and fell nearly silent. Abed’s uncle stood outside the mosque, while groups of the military wings of Fatah, Hamas and the Popular Front for the Liberation of Palestinian gathered on the main street. While religious authorities performed Islamic rites on Abed’s body, women gathered in the court of the United Nations schoolyard where Abed was a student. Medics surrounded Abed’s mother outside the school. The grief of losing her 13-year-old son made her physically sick. The medics called for the crowd to move and give her air. She was unable to express many words through her tears, but told Ma’an that her son went to school and never came home. “My son is dead, he is dead,” she wailed, unable to continue. Abed’s aunt, Manal Obeidallah, was just as wrought with grief as the boy’s mother. She told Ma’an that there would be no life without her nephew. ‘How can you live after one that you watched grow up, one that you raised, is killed in cold blood?” she asked. When the Islamic rites are finished, mourners carried the body to the nearby cemetery to lay Abed to rest. As the boy’s body reached the open grave, grief turned into palpable anger, and young men got ready to clash with the Israeli army waiting just behind the gate in the separation wall a few hundred meters away. Clashes began and more young men were shot and injured by Israeli forces, adding to the ever increasing number of Palestinians injured in the latest wave of clashes. Soon Abed’s young face would be featured on posters throughout his neighborhood in Aida camp, plastered on the wall next to scores of other ‘martyrs,’ some of whose posters were hung in mourning years ago. Murals would be made in his honor, and his face would be enshrined, forever 13.